Remnants of the fluid phase at ultrahigh pressure (UHP) in subduction environments may be preserved as primary multiphase inclusions in UHP minerals. The mode of crystallization of daughter minerals during precipitation within the inclusion and/or the mechanism of interaction between the fluid at supercritical conditions and the host mineral are still poorly understood from a crystallographic point of view. A case study is represented by garnet–orthopyroxenites from the Maowu Ultramafic Complex (China) deriving from harzburgite precursors metasomatized at ~4 GPa, 750 °C by a silica- and incompatible trace element-rich fluid phase. This metasomatism produced poikilitic orthopyroxene and inclusion-rich garnet porphyroblasts. Solid multiphase primary inclusions in garnet display a size within a few tens of micrometres and negative crystal shapes. Infilling minerals (spinel: 10–20 vol%; amphibole, chlorite, talc, mica: 80–90 vol%) occur with constant volume proportions and derive from trapped solute-rich aqueous fluids. To constrain the possible mode of precipitation of daughter minerals, we performed for the first time a single-crystal X-ray diffraction experiment by synchrotron radiation at Diamond Light Source. In combination with electron probe microanalyses, this measurement allowed the unique identification of each mineral phase and reciprocal orientations. We demonstrated the epitaxial relationship between spinel and garnet and between some hydrous minerals. 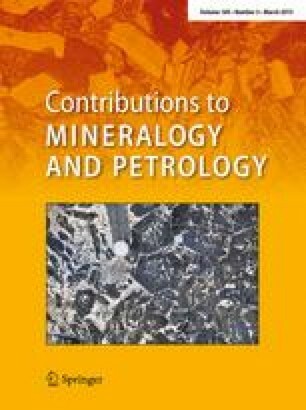 Such information is discussed in relation to the physico-chemical aspects of nucleation and growth, shedding light on the mode of mineral crystallization from a fluid phase trapped at supercritical conditions. We acknowledge R.J Angel for providing OrientXPlot software and M. Bruno for constructive discussion. Comments by A. van den Kerkhof and an anonymous reviewer, and the editorial handling by J. Hoefs, helped to improve the manuscript. N. Malaspina thanks the financial support by the University of Milano Bicocca FAR12/13 (12-1-2009100-139). This work also benefited from the Italian Ministry of Education, University and Research (MIUR) [PRIN-2012R33ECR], and from the ERC Grant No. 307322 (to F. Nestola).